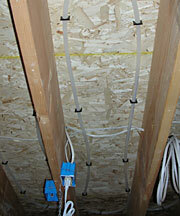 June 7, 2007 - We attached the PEX tubing to the wire mesh. After the dirt was graded, gravel poured, 2" rigid foam insulation, 6" wire mesh, the 1/2" PEX tubing was tie-wrapped to the wire. 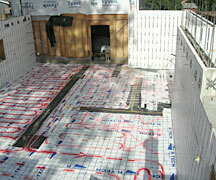 The red spray paint was used to mark the lay out of the PEX. The footings are covered in black plastic, they are going to support the walls. 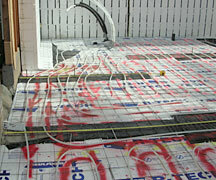 March 3, 2007 - Master Bedroom floor - Stapled up the pex radiant heat tubing (from Radiant Direct) and covered with 1/4" foil backed insulation. 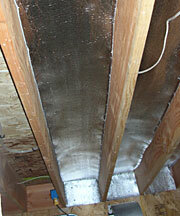 This is looking at the floor of the second story master bedroom. 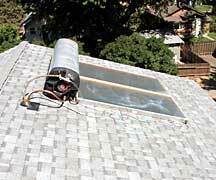 There is a Solahart solar water panel and tank on the roof to heat the radiant heat and domestic water.